If the spring 2012 runways were any indication, this season is all about taking your tresses to the next level — with get-noticed hair accessories. To help you get your locks ready for a new (and ultra-stylish season), we put together a few of the fabulous hair accessories we’re currently coveting. No time to do your hair in the morning? No problem. This eye-catching beaded clip (above)(neimanmarcus.com, $35) offers an easy way to add some interest to your look without the hassle of a full-on blow out. Simply sweep hair to one side, add some light hold hair spray to keep strands in place and finish with the clip, which features faceted rhinestones and beads for a hint of bling. 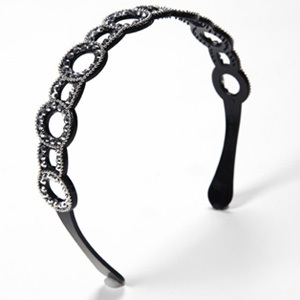 Keep errant strands out of your face and create an elegant, polished look with this pretty headband (designsbystephene.com, $28). We love how versatile this piece is (take it from day to night with ease) and the subtle sparkle it adds to an otherwise neutral outfit. This on-trend hair accessory looks good with either short or longer locks. Bobby pins need not be boring. In fact, we say let them steal the show! 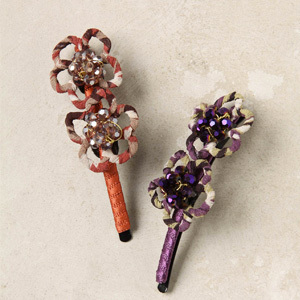 Add a pair of these fun but fashionable pins to your hair, whether you’re going to the office or heading out for the night with friends (anthropologie.com, $18). The pretty pins feature silk-wrapped daisies around sparkly beaded centers for a fresh, spring-inspired look. Give your everyday look a new twist with this chic head wrap (urbanoutfitters.com, $24). The corded wrap is topped with rows of metallic beads and trimmed with long chain fringe and sea shells for a touch of playful whimsy. Florals are back for spring. 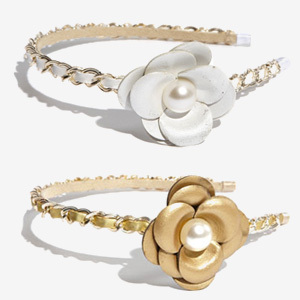 Show your petal passion with this elegant leather flower headband (Nordstrom.com, $38). The stylish piece features a pearl bead centered around a leather bloom, atop a chain embellished satin headband — a hair accessory sure to turn heads no matter where you wear it.